Saudi Arabia’s defense minister is likely to meet Vladimir Putin on the sidelines of the St. Petersburg International Economic Forum. The energy giants look to revive bilateral ties that have been sagging since they began supporting opposing sides in the Syrian conflict. Saudi Arabian Defense Minister Prince Mohammad bin Salman will visit Russia this week, sources told Kommersant. The visit should help unblock relations between the two countries, which have been frozen because of their opposing positions on Syria. Sources say that preparations are on for a meeting between the prince and Russian President Vladimir Putin on the sidelines of the St. Petersburg International Economic Forum. Saudi Foreign Minister Adel Al Jubeir will most likely join Prince Mohammed at a Russia-Saudi Arabia business meeting held within the framework of the St Petersburg forum. 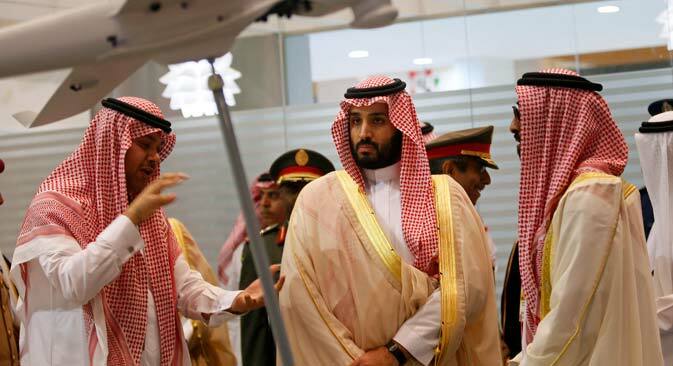 Prince Mohammed and the Saudi delegation's visit had been shrouded in silence until the very last moment, with officials in Moscow refusing to comment on any speculation. Meanwhile, foreign journalists accredited in Moscow went to St. Petersburg in advance to report on the Saudi delegation's visit, which promises to be one of the forum's main talking points. Experts interviewed by Kommersant see the visit of the Saudi delegation to the St. Petersburg International Economic Forum as a prelude to the arrival of the Saudi monarch himself. On April 20, 2015, during a telephone conversation, President Putin invited King Salman to visit Russia. Dudarev sees ties improving between Russia and Saudi Arabia. “Even though differences between Moscow and Riyadh on the events in Syria and Yemen remain, it looks like the sides have chosen to separate politics from business and reestablish full-scale cooperation in the trade and economic fields,” he says. The Russian-Saudi Business Forum agenda includes issues related to cooperation in the fields of food security, infrastructure construction, power generation, banking cooperation, tourism, petrochemicals and oil services. During the Saudi delegation's visit, international cooperation agreements are expected to be signed in the fields of the peaceful use of nuclear energy, space exploration and the joint use of the Russian GLONASS navigation system. The countries' corresponding ministries will also sign memorandums of understanding in the fields of cooperation in agriculture, residential building construction and utilities. Prince Mohammed bin Salman and the officials accompanying him are not the only delegates from Riyadh visiting Russia this week. Saudi military officials participated in the Army 2015 International Military Technical Forum that is taking place in Kubinka. Citing a source in the Saudi delegation, TASS wrote that the Saudi military wishes to discuss the purchase of the Russian Iskander-E tactical ballistic missile systems. A representative from the Rosoboronexport, Russia’s state-run arms exporter declined to comment. However, several well-informed sources confirmed that Saudi Arabia is indeed on the list of potential buyers interested in this system. It is unlikely that a deal for supplying Riyadh with Iskander systems will be reached soon. Iskander manufacturer Konstruktorskoye Byoro Mashynostroyeniya has a backlog of orders from the Russian Defense Ministry. It will only have an opportunity to take foreign orders from 2016-2017.